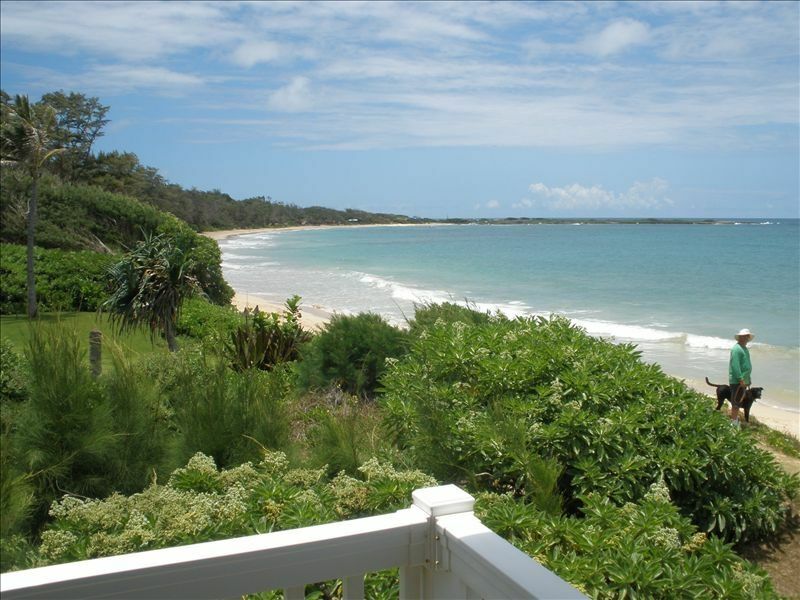 This lovely home is on 1/2 acre beachfront at Malaekahana Bay on the North Shore of Oahu. This house is located on a white sandy bay with cool breezes and a peaceful atmosphere for a relaxing get away. On either side of the bay you can surf, and in front of the house you can fish , swim/boogie board, look for shells, sunbathe, or just relax. Perhaps you can spot a sea turtle or two, soak up the sun ,and then enjoy the beautiful sunsets. This beach is a treasure because it is rarely crowded or congested. There are 3 separate bedrooms with 2 1/2 baths. There is one queen bed in each of the beachfront bedrooms, and one of these beachfront bedrooms also has a twin bed. There is a bunkbed with double on bottom and twin on top plus a separate twin bed in the 3rd bedroom. We also have a daybed-type couch in the living room. There is a large grassy area where you can play football, frisbee, or BBQ. Wake up each morning to lovely sunrises and look for shells that may have washed up. Take a walk to either end of the bay and you will have walked about 2 miles. Our 2016 improvements included all new beds and bedding. For 2017 we have installed new windows and sliding glass doors. Drive to the famous surf spots on the north shore, visit Polynesian Cultural Center or Waimea Bay .There are 2 championship golf courses 5 minutes away designed by Arnold Palmer and Tom Fazio. This is a vacation spot for the whole family to enjoy! The quaint town of Haleiwa, with it's restaurants, galleries, and shops, is a 30 minute drive to the west. Direct beachfront, panoramic views! Sandy beach--great for long strolls, beach combing, swimming. Gorgeous mountain views from large yard and mountain side covered lanai. Ocean views from living room and 2 beachfront bedrooms. Large covered lanai on ocean side for relaxing, dining, games, etc. All bed linens, bath towels, and beach towels are provided. Full kitchen with everything you need to make great meals. Dishwasher for easy clean up. Very large lawn-- great for kids! Gorgeous views from large covered lanais. Have your meals, read books, or just relax while enjoying the sound of the ocean and the great views. Very large yard. We welcome children. We had a really great time staying at the beach house.... The home and property is just as described. Really great front yard for parking, playing some volleyball or catch... doing BBQ.. The wrap around deck is great and offers beautiful views of the ocean. The layout of the home is perfectly situated for family get togethers... with the community areas directly in the center of the house with bedrooms off to the side. Kitchen is large and has everything you need to cook... Pots and pans are of good quality and there are ample sizes to work with. When it was too windy or rainy, there are board games and puzzles to occupy time besides the TV. The home is 5 minutes away from Foodland Laie so groceries were never an issue. Our group is already trying to figure out when we can get out again! Wonderful location & an amazing beach! A hidden gem. We loved our stay & hope to visit again soon! The house is pretty simple and minimally stocked but the grounds, the deck, the beach access, are almost impossible to beat if you want to be in this location. It was perfect for our family. We loved our stay at the beach house! We enjoyed the privacy of the beach and the huge deck overlooking it! We had a wonderful week at this property. It has a perfect location, and is a beautiful beach house. We couldn’t have asked for a better location - quiet, private and secluded, steps from the sand, yet easy to access town. The property manager was easy to deal with, and all the logistics worked out perfectly. This place is just amazing. The property manager was great and very accomodating. The photo taken from the edge of the lanai doesn’t really do it justice. The beach is about 10 steps from the back of the house. We spent about 4 hours each day on the beach. There is a shallow reef in the beach just at the back of the house. But turn just to the left and you get enough water for a nice wallow. Go further up to the left and you will have one of the most amazing, and private, swims at the beach. A nice little wave as well that our kids loved on the boogie boards and tubes (they are under the house). Each day we were swimming there we would see a sea turtle close by. On our last swim we were surrounded by 4 sea turtles! Great wave to surf down to the right. We stayed there with our two kids (4 and 2), and another couple with their kids (8 and 6). The house is perfect for families. This house is a home. The front yard isn’t in any of the photos, but it is an asset as well. Our kids loved it out there. When we were leaving my wife said, “this is the place you stay at for a month”. I couldn’t agree more. We will be back! We are direct beachfront at Malaekahana Bay. We are a short drive to Turtle Bay Resort where you can enjoy golf, great restaurants, horse back riding, and other activities. To the east, we are a 5 minute drive to Brigham Young University Hawaii , the Mormon Temple, and the Polynesian Cultural Center. There are miles and miles of gorgeous beaches in either direction.